Could sitting be the new smoking? ‘Sitting disease’, as it’s known, develops from our sedentary jobs and lifestyles. The 50 or more hours spent sitting each week are a hot topic for medical experts who say there are strong links between sitting and obesity, diabetes, and heart disease. The solution, they say, isn’t to sit for six hours at work and then head to the gym afterward, because evidence suggests that the negative effects of extended sitting can’t be countered by brief bouts of strenuous exercise. The answer is incorporating standing, pacing and other forms of activity into your normal day. Standing at your desk for part of it is the easiest way of doing so. Researchers have determined that with a standardized diet and exercise regimen, some people will gain weight, while others will stay slim. It was discovered that the people who weren’t gaining weight were up and walking around, on average, 2.25 more hours per day, even though all of them worked at (sitting) desks, and no one was going to the gym. These people had opportunities to move around substantially more at work by doing such mundane things as walking to a colleague’s office rather than emailing them, or taking the stairs instead of the elevator. Failing to take advantage of these constant movement opportunities during a working day, as it turns out, is closely associated with obesity. Some of the same studies have found that sitting for extended periods of time is correlated with reduced effectiveness in regulating levels of glucose in the bloodstream, part of a condition known as metabolic syndrome that dramatically increases the chance of type 2 diabetes. A 2008 study, for instance, found that people who sat for longer periods during their day had significantly higher levels of fasting blood glucose, indicating their their cells became less responsive to insulin, with the hormone failing to trigger the absorption of glucose from the blood. Scientists have also found that adults who spend two more hours per day sitting have a 125 percent increased risk of health problems related to cardiovascular disease, including chest pain and heart attacks. Other work has found that men who spend more than five hours per day sitting outside of work and get limited exercise were at twice the risk of heart failure as those who exercise often and sit fewer than two hours daily outside of the office. A handful of studies have suggested that extended periods of sitting can be linked with a higher risk of many forms of cancer. Because of the higher chance of obesity, diabetes, cardiovascular disease and cancer, a number of studies have found strong correlations between the amount of time a person spends sitting and his or her chance of dying within a given period of time. These studies indicate that sitting, in isolation, can lead to a variety of health problems and increase the overall risk of death, even if you try to get exercise while you’re not sitting and eat a healthy diet. And though there are many situations besides the office in which we sit for extended periods (driving and watching TV, for instance, are at the top of the list), spending some of your time at work at a standing desk is one of the most direct solutions. Working Health can provide you with ideas on how to stand and deliver at work, as well as help you find solutions to become more mobile at work. Also, if you have more specific questions related to implementing standing desks and ergonomics in your workplace, please call us on 0800 430 209 or Email Us today. 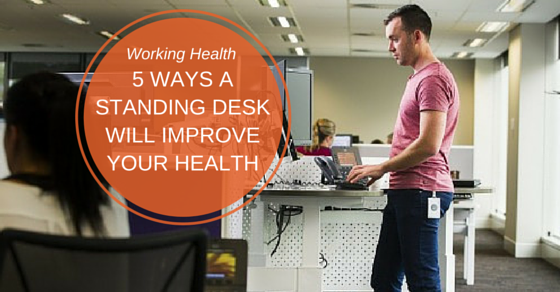 Has this post about 5 Ways A Standing Desk Will Improve Your Health been helpful? Please SHARE so that others can enjoy it too. Posted in Ergonomics, Healthy Workplace.